This fragment of sandstone has indentations on both ends that suggest it was used as a nutting stone. 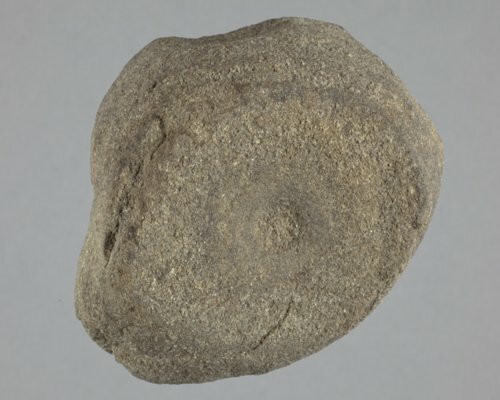 Sometimes named anvil stones, cupstones, or pitted stones, artifacts such as this one are thought to hold a nut in place while the nutshell is cracked. It was collected from the Wullscheleger site in Marshall County and donated to the Kansas Historical Society in 1961. The site was occupied periodically throughout the Early, Middle and Late Ceramic periods.